Stone properties can either present Hard Plastered or Plaster on Lath internal finishes. In solid wall construction where the walls are hard plastered ,certain systems can be mechanically fixed straight to the wall and, owing to their very impressive Thermal Conductivity, these can provide target U-Values with the least intrusion into the room. However, these systems are very expensive and can present dust issues where the tenant is not decanted. In cavity wall construction, it possible to mechanically fit a larger range of insulated plasterboards directly to the existing wall. Where the cost or dust issues prohibit the use of aerogels, high performance foam insulated plasterboards can be used. 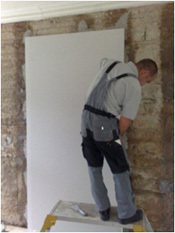 Whilst these boards may only be an inch thicker, there may also be a requirement to strap the wall or apply the boards using plaster dabs as shown opposite. This depends on the wall construction (ie: hard plastered solid walls). When considering solid stone walling, hard plastered finishes present the same options as the no-fines and solid brick options. However, it is more likely that solid masonry walls will be finished internally with plaster on lath or, if refurbished at some point in the past, plasterboard on timber straps or framing. Where plaster and lath finishes exist, it is of course cheaper, quicker and less of a mess to over line the walls with a suitable insulated plasterboard. Aboard approximately 60mm thick mechanically fixed through the existing plaster and lath would achieve a target U-Value. The choice of board and detailing compliments the characteristics of the room and all electric and radiator alterations are carried out by the team. Take action now to reduce your annual energy costs. The results can be striking. We've always recognised the need to be responsible with our use of energy and resources. Sign up to our monthly newsletter for the latest news and offers. ©BCA Group Ltd. All rights reserved.